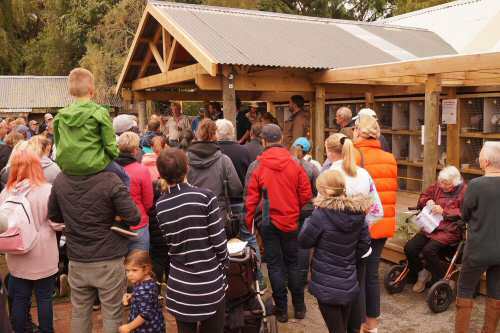 The Canterbury Section of the Rare Breeds Conservation Society of New Zealand holds a Rare Breeds Auction and Heritage Lifestyle Day on the second Sunday of March each year. Entry fees, Sales Commission, Admission charges and Catalogue price are used to cover Auction expenses with any surplus going to the Rare Breeds Conservation Society for the conservation of rare and heritage breeds of livestock. Stock on view from 10.00 a.m., Auction starts 12.00 noon. See Auction Details and Downloads for details. The Rare Breeds Auction is the main fundraiser for the local group of the Rare Breeds Conservation Society of New Zealand and all money raised will be used to support Rare Breeds projects, which will include more work on the Enderby Island cattle – cattle that had survived on the Sub-Antarctic Enderby Island in the Auckland Island group for over 100 years and had adapted to the harsh living conditions there. Another animal from this isolated archipelago – the Auckland Island Pig, which was saved from extinction by the society in the 1990s – has already proven how important our work is: it is the only pig left in the whole world that is not a carrier of certain viruses thus making them the only suitable pig to grow organs to transplant into humans. The Auckland Island pig may well – one day – become the pig that saves your life! Thanks to Marina Steinke for the above text and photograph. Go to Auction Photos for more Auction photographs. See Auction Details and Downloads for more information.